WASHINGTON COUNTY – Snowbound campers, mules and a chance rescue kept the Washington County Search and Rescue team hopping on Saturday. SAR volunteers performed three rescues in Washington County Saturday – including one rescue that happened entirely by accident. Four members of the search and rescue team were in the Kolob area of Zion National Park Saturday, recreating in the fresh snow in their Jeeps, Washington County Sheriff’s Deputy Darrell Cashin said. 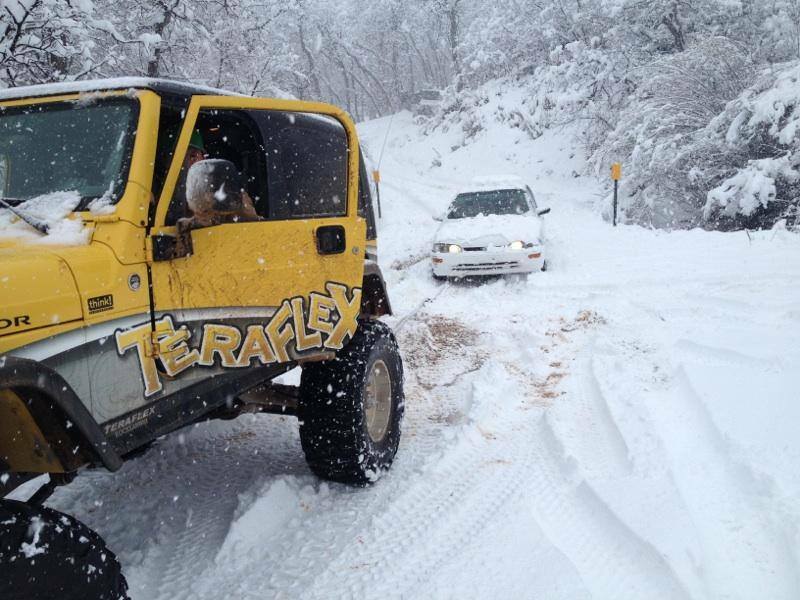 The team members were not on duty – just enjoying the fresh powder. About 5 miles north of Kolob Reservoir, on Kolob Terrace Road, the SAR volunteers spotted a Chevrolet Suburban that was off to the side of the road and apparently stuck in a ditch. There were no tracks in the snow near the vehicle. “It was pristine snow, so they knew (the vehicle) had been in there a little while,” Cashin said. The SAR guys got out to investigate the stranded vehicle, and they found a woman in her 50s alone inside the Suburban. “She’d been there a day and a half,” Cashin said. There was no cellphone reception in the area, so the woman wasn’t able to call for help after crashing into the ditch. She simply stayed with her vehicle and waited for help. If the SAR guys hadn’t happened along, Cashin said, she could have been stuck there for several more days on the seldom-traveled road. “They said when they pulled up she just started crying,” Cashin said. 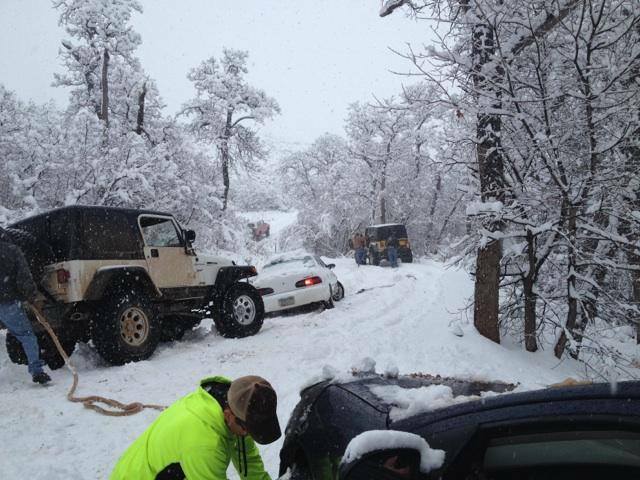 The SAR volunteers were able to pull the woman’s car out of the ditch with one of their Jeeps. The woman was crying and shaking so badly she wasn’t able to drive her vehicle once it was free, so one of the SAR volunteers drove it for her. Cashin said the woman was not local – her vehicle had out-of-state plates. He said he doesn’t know why she had been traveling on Kolob Terrace Road. “I get people from all over the country that seem to think that road – which it will, if it’s normal (conditions) – will take you over to Cedar City,” Cashin said. But in snow conditions, that road should not be traveled by motorists. “I’ve had people who have told me that GPS told them to take that road,” Cashin said. At the end of the day, the woman was very fortunate not only to be found, but to be found by Washington County’s resident rescuers. “I was really proud of my guys,” Cashin said. At about noon on Saturday, the SAR volunteers responded to a rather unusual rescue call, when they attended to a rollover accident in the Warner Valley area. This wasn’t any ordinary rollover, however; the passenger had been riding a mule at the time of the incident. Cashin said when he first heard the call, he assumed the word “mule” referred to an ATV – but he found out the injured rider had been riding the kind of mule that has four legs and a tail. “The mule probably slipped or got spooked or something,” Cashin said. 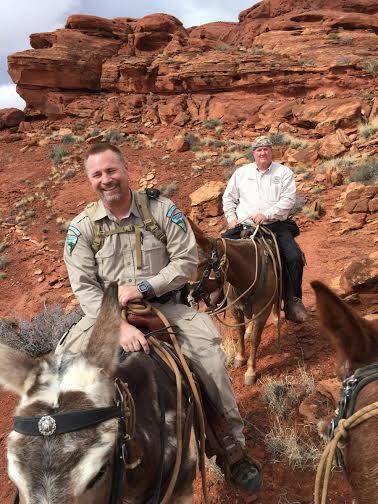 The injured rider, a 22-year-old man, had been with at least one other person riding mules over the backside of the sand dunes in Warner Valley, over Honeycomb Ridge, Cashin said, when the mule somehow lost its footing and ended up rolling over top of the man. “I was told they were halfway down the ledge,” Cashin said. The man’s companion called for help, and nine search and rescue volunteers responded to the area along with responders from the Bureau of Land Management, the Washington County Sheriff’s Office and Utah State Parks. The SAR Jeeps couldn’t reach the area where the accident occurred; rescuers would have had to climb to get to the injured man and either lift or lower him out. He was complaining of hip and lower back pain, Cashin said, so responders didn’t dare remove him that way. With potential back injuries, rescuers err on the side of caution. In the end, the man was airlifted. “They called Life Flight due to the injuries and where he was located,” Cashin said. Life Flight was able to land fairly close to the man, he said. “They treated him, patched him up and got him out of there,” Cashin said. The third rescue of the day took the SAR volunteers to the Oak Grove Campground area of Dixie National Forest. Four adults had been camping in Oak Grove overnight and woke up to snow. “(They) woke up this morning with 6 inches of snow and were stuck in there, couldn’t get out,” Cashin said. Washington County Sheriff’s responders and BLM rangers responded to the area as well as SAR volunteers. The SAR guys were able to pull the campers’ vehicles out with their Jeeps. There was approximately 6 inches of snow on the ground when the responders got there, and the snow continued falling while they rendered aid to the campers. An unusually busy kickoff to 2015 continues for the search and rescue team. “We’re up to around 20 searches this year so far – calls that we’ve been on – which is almost 50 percent of everything we went out on last year,” Cashin said. “It’s a very steep increase for us,” he added. He said he thinks the unseasonably warm weather in January and part of February can at least partially account for the spike in rescue calls. The warm days drew people out of their homes into recreation areas, and the sudden winter storms have created their share of rescue-rife conditions, as well. The search and rescue volunteers love what they do, Cashin said. Being gone this frequently, however, can cause spouses and family members to start grumbling a bit. “A little break every once in a while is nice, but it is what is it,” Cashin said. The Washington County Search and Rescue team operates under the direction of the Washington County Sheriff’s Office and is comprised of unpaid volunteers who use their own equipment to assist in rescue missions. The only compensation team members receive is the gratitude of rescued individuals and their loved ones at the end of a successfully completed mission. Washington County Search and Rescue: Who are they? Who pays? This is to the spouses and family members who grumble about the amount of time their loved ones spend on training and missions: Instead of grumbling and being negative about what these folks do, you should be down on your knees thanking what ever God you believe in, that you are lucky enough to be with this type of person! You could have a spouse that spends their time and money in a bar, getting wasted every night. Or one that is a total couch potato. Or one that is out running around on you. Gotta love Search and Rescue, heroes!